Strength training to enlarge the pectoral muscles in teen males is appropriate with the help of spotters and proper supervision by adults to ensure the correct technique. It builds strength, increases bone density, reduces the risk of sports-related injuries and improves self-esteem. Teens should perform chest exercises at least twice a week, with at least 24 hours between sessions, to see results. Perform push-ups. Lie on your stomach on a mat. Place your hands flat on the floor under your shoulders and lift your body up, balancing on your palms and toes. Your body should be in a straight line. Bend your elbows and lower your body until you almost touch the floor. Do not lock your elbows. Repeat for a set of 10. If the exercise is too hard, try balancing on your palms and knees instead, with your body still in a straight line. Do bench presses. Lie on your back on a bench. Bend your knees and place your feet flat on the floor. Hold a barbell with both hands slightly wider than hip-width apart on the bar. Your palms should face the wall in front of you. Straighten your arms and push the barbell over your head. Bend your elbows and lower the barbell until it barely touches your chest. Repeat for a set of 10. Add decline dumbbell bench presses. Lie on a decline bench on your back, with your head on the lower end. 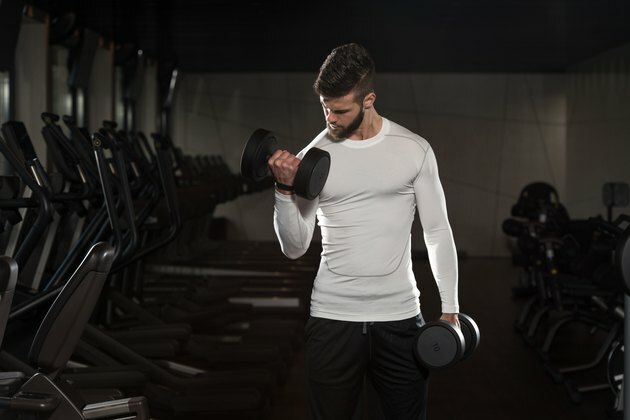 Hold a dumbbell in each hand. Lift the dumbbells into the air. Bend your elbows and lower the dumbbells to the level of your chest. Repeat for a set of eight. Stretch the muscles in your chest to increase flexibility after your workout. Position yourself on your hands and knees on the floor, with your knees under your hips and your wrists under your shoulders. Arch your back upward like a cat. Then make your back flat. Arch your back downward. Then make your back flat again. Get a physical examination from your doctor before starting to lift weights. If you cannot lift the weight comfortably eight times without resting, the weight is too heavy.